Patients suspected of toxic alcohol ingestion, to prevent formation of toxic metabolites. Indications include ingestions of methanol, ethylene glycol, and diethylene glycol to stop metabolism of formic acid, oxalic acid, and diglycolic acid, respectively. Fomepizole is not indicated for known isopropyl alcohol ingestions. Fomepizole is safe in adults and children, and is a Category C drug in pregnancy (adverse fetal effects have been observed in animal studies but no adequate studies have been performed in humans, and potential benefits may warrant use). Patients should be on telemetry and BP monitoring during infusion, as fomepizole can cause bradycardia and hypotension. After 48 hours, dose should be increased to 15 mg/kg every 12 hours as fomepizole induces its own metabolism. If fomepizole is not available, ethanol can be given to block alcohol dehydrogenase. 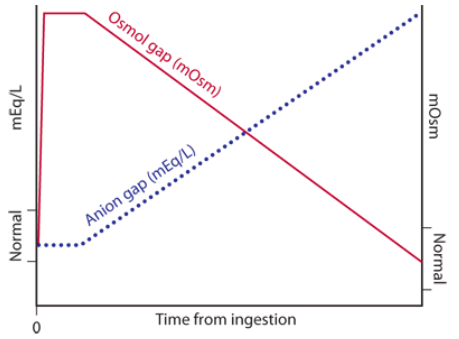 While Anion Gap and Serum Osmolality/Osmolarity may help with decision making, normal anion gap and osmol gap do not exclude toxic alcohol ingestion. Patients with signs of end-organ damage from toxic alcohol should be referred for immediate hemodialysis in addition to fomepizole. Lack of clinical intoxication cannot exclude toxic alcohol ingestion. Fomepizole is an alcohol dehydrogenase inhibitor used to prevent the formation of toxic metabolites formed after the ingestion of toxic alcohols. If a patient has an unexplained anion gap or osmolar gap, resuscitate the patient with fluids and thiamine, with or without glucose (food or IV dextrose) and repeat the BMP and osmolar gap in an hour. If anion gap worsens, consider toxic alcohol ingestion. 15 mg/kg IV loading dose. After 12 hours give 10 mg/kg for the next four doses. Then give 15 mg/kg every 12 hours thereafter. Give at onset of dialysis if last dose was >6 hours prior. Give every 4 hours during dialysis. At completion of dialysis, give scheduled dose if >3 hours since last dose, or ½ dose if 1-3 hours since last dose. Howland MA. Antidotes in Depth: Fomepizole. In: Flomenbaum NE, Goldfrank LR, Hoffman RS et al, eds: Goldfrank’s Toxicologic Emergencies. New York NY, 2006;1460-1464. Brent J. Fomepizole for ethylene glycol and methanol poisoning. N Engl J Med. 2009;360(21):2216-23. Brent J, Mcmartin K, Phillips S, Aaron C, Kulig K. Fomepizole for the treatment of methanol poisoning. N Engl J Med. 2001;344(6):424-9.